Hydric Media partnered with Gatorade and Spotify to create a playlist tailored to your workout. 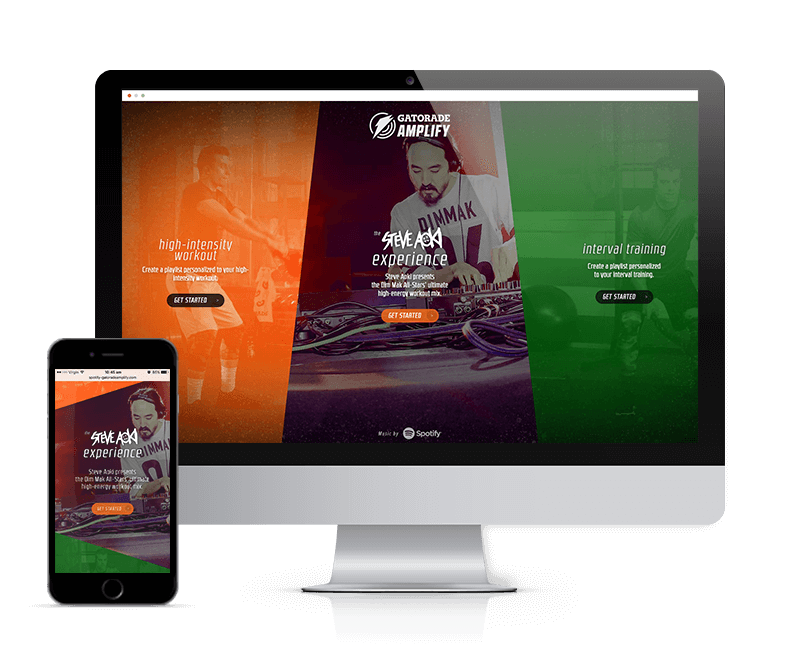 Over the past four months we partnered with Gatorade and Spotify to create a web-based application that would deliver personalized, insight-driven music recommendations to power fitness training. The result of the collaboration is Gatorade Amplify. We were charged by Spotify with responsibility for the technology concepts, user experience design and development of the app. The Amplify app allows users to generate their own personalised high-intensity and interval workout playlists accurate to the second, that automatically refresh with new music every week. The application is the centrepiece of a national-scale digital branding campaign in the US featuring Spotify ad media, managed by Omnicom, with special music supervision by Steve Aoki and his Dim Mak label. We were uniquely positioned to provide insight and advice about how to combine the wealth of Spotify APIs to construct a cohesive and powerful experience for fitness fans. Each Gatorade Amplify playlist makes use of multiple music recommendations, custom playlist artwork, custom cross-faded audio, each one of these features bringing something vital to the user experience. By leveraging our proprietary Spotify playlist management platform Line Up, Spotify users can save their Gatorade Amplify playlists to their library and they will update automatically with new songs every week. The app has already been hailed by Cnet, B&T and Fast company, whom all agree that the app will optimize users workouts by providing personalized and energetic music. Jeff Beer states that “Gatorade Amplify takes the same type of wizardry Spotify uses for its Discover Weekly playlists and applies it to your workouts”. Experience Gatorade Amplify for yourself here.